You are currently browsing the tag archive for the ‘battle cruiser’ tag. ‘Fleets of Stren’th’ is the third in a series of cartoons in which Popeye has joined the American navy. In this cartoon Popeye still is a lousy sailor, but when the battle cruiser is under attack, he once again shows what he’s able to do (see also ‘Blunder Below‘). This time the battle cruiser is attacked by a squad of Japanese dive bombers. 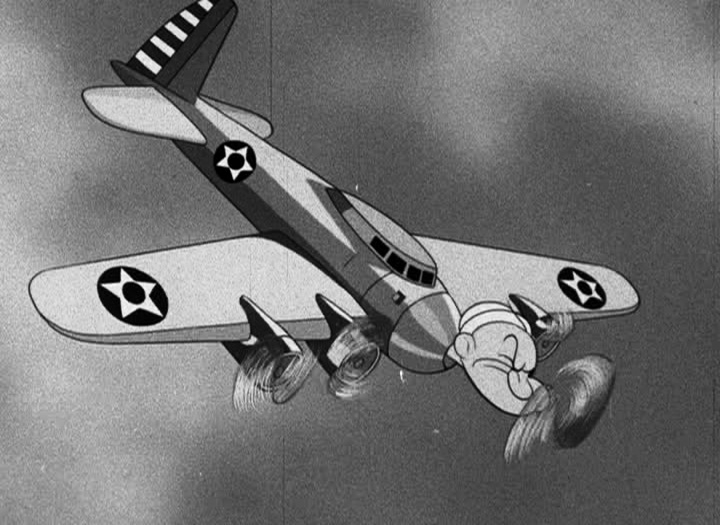 It takes some time before Popeye is able to eat his spinach, but when he does, he turns into a plane himself, defeating the complete enemy fleet. In this process we see only one pilot, the other planes are subtly dehumanized. In this way we’ll never think of the fate of the Japanese pilots, at all. This was a clever device used in many war propaganda films of the time.